We continue our partnership with Sioux Falls Woman Magazine, promoting the mission of the Presentation Sisters. In honor and recognition of the 300th anniversary of Nano Nagle’s birth, each article focuses on a different characteristic of Nano. 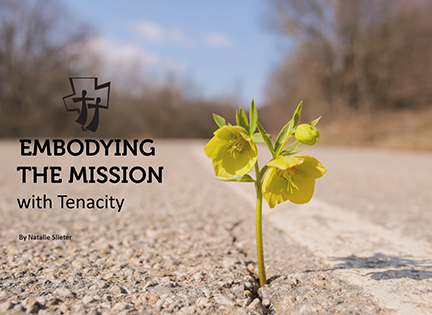 The October / November issue focuses upon Embodying the Mission with Tenacity. Nano Nagle lived in Ireland during a time of oppression for the Catholic Church. Despite the circumstances, she was a tenacious woman with deep convictions about ministering with the poor, marginalized, and vulnerable, people who hold a special place in the heart of God. Nano violated the penal laws by opening secret schools to educate Catholic children. This was work she felt strongly about despite the risk of severe consequences for herself and her family. 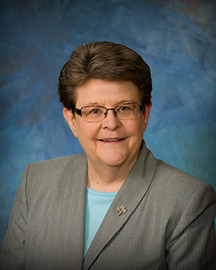 Sister Janet Horstman defines tenacity as flowing from a clear and focused sense of purpose or call and being persistent, despite the obstacles that lay ahead. “Everything Nano did flowed from her deep convictions and call,” Sister Janet explained. Nano made the decision to violate the law. Sister Janet says it was to obey a higher law, from God’s law. Nano was living with her brother at the time and he was furious upon discovering what she was doing. Nano knew she couldn’t stop, so she offered to move out of her brother’s home, but he relented and she persevered. As the schools grew, Nano brought Catholic sisters from France to assist her, which was also against penal law. After their arrival, she realized they were unable to teach outside their convent due to their enclosed lifestyle. Sister Janet imagines the difficult decisions she faced, and believes Nano’s deep center was filled with God’s love from which she drew strength that allowed her to carry forward her work. It wasn’t until later she was called to start her own community of sisters. Following an invitation by Bishop Martin Marty in 1880, Presentation Sisters from Dublin, Ireland traveled to Dakota Territory filled with Nano’s spirit. They came to teach Native American children and French settlers as they began to establish their ministry across the globe. Their journey was difficult, as was the first winter, yet they were determined to carry on and were assisted in doing so by the generosity and hospitality of the Native Americans. Today, one way the Presentation Sisters show tenacity is by partnering with others to continue and grow their healthcare and education ministries in very challenging times.They are also committed to the variety of justice issues including peacemaking, working with immigrants, environmental issues, abolishing the death penalty, and assisting people to have a voice when they aren’t included at the table where decisions are being made that impact their lives. “We are blessed with so many wonderful partners who embody the mission, live it every day and are so committed to the legacy of the sisters,” Sister Janet said. To show tenacity, Sister Janet encourages the Sioux Falls community to first get in touch with what matters to them deep inside to figure out what their mission is. If it’s tough to follow through on commitments, start small and practice being faithful. “Good intentions are a good start, but a piece that’s often missing is following through on it,” Sister Janet explained. Surround yourself with a community of individuals with like values thatcan be your support system. When it gets tough, be tenacious and keep working toward your mission, like Nano all those years ago. Sister Janet Horstman shows tenacity each day as she journeys with newly arrived immigrants at Caminando Juntos. She isthe only bi-lingual accredited representative for immigration legal services in the state of South Dakota. To learn more about her, Nano Nagle, or the Presentation Sisters, please visit www.presentationsisters.org.